We'll continue on with the luggage-sticker theme for one more day. 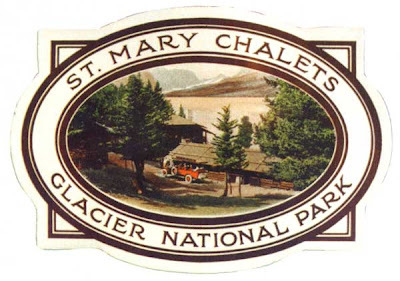 This one is also from the 1920s, and advertises the old St. Mary Chalets complex in Glacier Park. The chalet complex was one of several built by the Great Northern Railway in the 1910s, as it worked to develop Glacier tourism. Located on the south shore of St. Mary Lake, a couple miles west of the current town of St. Mary, the chalet was an important landmark for park travelers in the early years. It was a stopping place on the first road up towards Many Glacier, the terminus of the famed "Inside Trail" horseback route, and the place to catch a boat for the spectacular Going-to-the-Sun Chalets. But changing travel patterns and the construction of new highways that bypassed the chalet sealed its fate. The place closed down for good in the 1930s, and it was demolished in 1943. If you hike out to the site today with a sharp eye, you'll be able to spot just a few bricks and bits of debris in the grass. They could use this, still; it's classic AND classy, don't you think? We spent quite a bit of time over in the Park when I was a kid (trips across the highline from Malta to Big Fork for camp) but I had never heard about the Chalets. My folks loved to eat a good steak at St. Mary's lodge, once they dropped us kidlets off. This is a neat one!